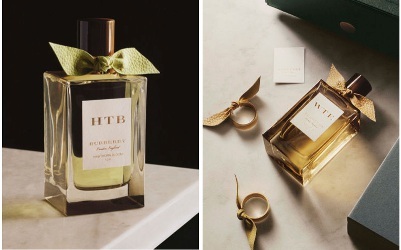 Burberry has launched Burberry Bespoke, a new collection of seven fragrances developed by perfumer Francis Kurkdjian: High Tide, Amber Heath, Tudor Rose, Hawthorn Bloom, Garden Roses, Antique Oak and Wild Thistle. High Tide ~ "The contrasts of a serene coastal setting. Imposing watchet blue Cornish cliffs meet an energetic rush of water at high tide. Crisp and green marine notes with oakmoss absolute, settled with fresh jasmine." Amber Heath ~ "Romantic and atmospheric: a courtyard in bloom set amongst the wilderness of a vast heath. A golden scene set at dusk. A modern amber scent with golden vanilla, patchouli and undertones of ambergris accord." Tudor Rose ~ "The symbolic union of the rose. Tangled within a Kensington garden – in serenity and strength, verdure and vitality. A shimmering scent of Bulgarian Damask rose and May rose. Finished with notes of patchouli and ambergris accord." Hawthorn Bloom ~ "The Yorkshire countryside landscape awash with the early signs of spring. Fragile ice melting as dawn light breaks, and the delicate beauty of hardy new-season buds in bloom. Fresh and gentle florals. Orris and violet balance musk, patchouli and jasmine." Garden Roses ~ "The portrait of a classic English rose patiently set amongst a Bloomsbury garden. Soft velvet petals perfectly in bloom. Fragrant Bulgarian rose layered with Italian lemon oil and vetiver." Antique Oak ~ "A fragrant masterpiece inspired by the legacy of British boatyards. A contrast of industrial strength and historic artistic intricacy. Captivating oud and sensual leather. Earthy, refined saffron and papyrus." Wild Thistle ~ " Vast, wild and inviting. Vibrant and shimmering hues of green verditer set against the Scottish heath. Lush, evergreen leaves and galbanum oil with floral notes and geranium leaf." Burberry Bespoke High Tide, Amber Heath, Tudor Rose, Hawthorn Bloom, Garden Roses, Antique Oak and Wild Thistle are available in limited distribution in selected Burberry stores and counters in Milan, Paris, London (Regent Street and Harrods), Dubai, Kuwait City, and the US (Spring Street in New York and Rodeo Drive in Beverly Hills). I’d like to see what FK would do with vetiver. Anyone know if he has created something that was vetiver centric? and I seem to recall one more…will post when it comes to me! Oh, excellent — totally forgot those! Wow, this would make a lovely gift. The classic bottle style is very appealing. The packaging does look lovely. Fear I would rather not know the price, though. This sounds like fun, and also reminds me of how my kids used to order a “large soda” at a fast food place and then proceed to do a “mixology” at the soda machine- some combos were genius, some were…best not to remember them…. And yes, they only got to do that once or twice a year, and they’re both thin and fit today! that bottle is so intriguing!